Live demonstrations at SPF Fort Lauderdale share the experience of some of our favorite, local and national master printers at work using classical, traditional and contemporary printing technologies and techniques. Ingrid Schindall of IS Projects leads this giant print demonstration with a construction grade steamroller, pressing prints as large as 40 x 90 inches. Artists are invited to bring their own giant blocks, try out our large format relief workshop, or just come enjoy the spectacle. Sign up to print at www.spf-ftl/the-steamroller. Join artist / professor Tennille Shuster and NSU art students for live screen printing during SPF'18! We will be printing off SPF tote bags for sale and running audience-sourced items on the press through out the day. Bring your own shirt/tote/bandanna/whatever and we'll screen print it! 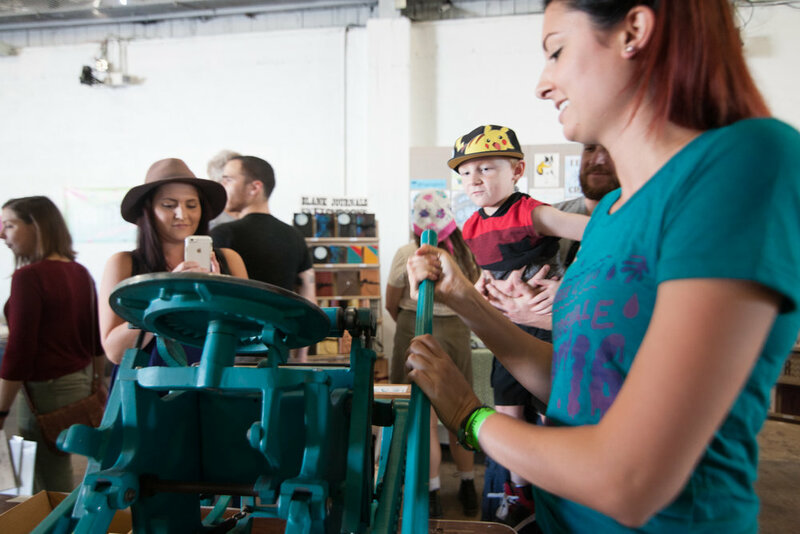 Join New York-born, Memphis-educated, Philadelphia-based artist and print legend Beth Sheehan of Sheeprints for ongoing demonstrations of a vintage letterpress and print your own SPF postcard! Join artist, instructor, printer and technician Sarah Shabarro, co-founder of Striped Light in Knoxville, Tennessee, for this demonstration and make your own 8 x 10” totally customizable mini poster and discover innovative ways to make new patterns and abstract forms using text and type. Ink your own letters, make your own patterns and pull your own prints in this super hands-on demo! Join Kim Spivey from Palm Beach based Ground Printmaking for a start to finish etching demonstration. Participants can work and mark into grounded plates, then watch the plates being chemically etched with a ferric chloride solution. Afterwards the plates will be cleaned up, inked up and printed on-site using an etching press!